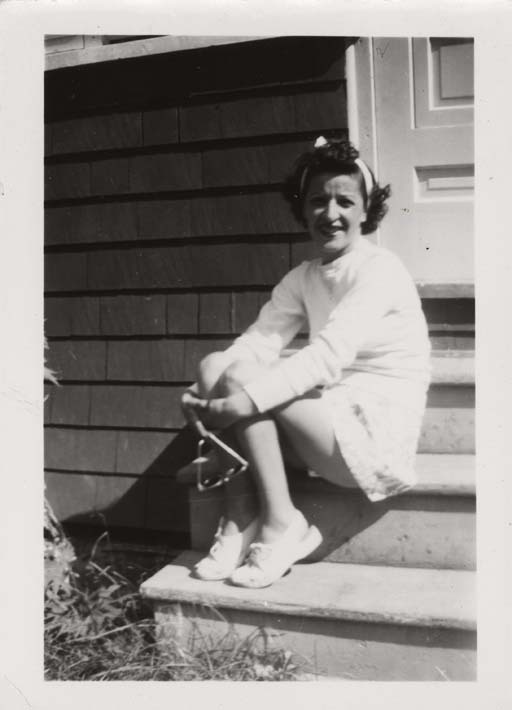 This is a black and white snapshot of Antoinette (Toni) Ciccarelli sitting on the steps of a house. It is a brick house with a light coloured door. Toni is wearing a light coloured outfit: a long sleeve top with a skirt, a headband, and lace-up shoes. She is holding her knees together with her arms and sunglasses dangle from her right hand. She is smiling straight into the camera. The right side of her face in partly in shadow.